After last post I ended up getting so frustrated with memory leaks from the 3D engine I was using (the asset-loader side of it) that I gave up on it. I decided it was painful enough that moving to a different engine would be less painful. In learning the new engine and language added to all the other issues in my life at that time I basically lost all my enthusiasm on the project and stopped. I still keep my ideas and notes and still add to them, the project isn’t totally abandoned just on hold. Right now I have my job and a whole heap of hardware projects that are consuming all my spare time. I’m also not great with making posts or communicating myself. I basically don’t say much because I don’t think I have anything good to say… Probably why I’m still working low-end jobs as I’m no good at “selling” myself despite all the things I can do. So for now I’ll keep the game project on my, rather large, list of things to do and note progress on if and when I get to it. I’ll try to get around to listing and making progress reports on all these Other projects on my main blog – radans.net. I’ve been tidying up some of the map maker code and removing external dependencies, mainly to get my brain back to what I was coding back when. Definitely had some “What was I doing here?” moments looking through what I had done as I was cleaning but got back into it ok. Apologies for taking so long at this, available time has not been good and I’ve been doing a lot of experimenting and learning as I go. So far I have Image tile generation running and the menu system for the rest of it going. 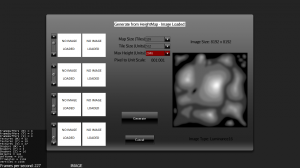 So far the menu works but the only real function working is: “Generate New Terrain” > “From HeightMap Image” > load any 16-bit Gray-scale PNG image > “Generate” > “Create Image Tiles”. Only 16-bit Gray-scale png images are supported at the moment, any size, I have two test maps, one small at 1024*1024 and one very large at 8192*8192. 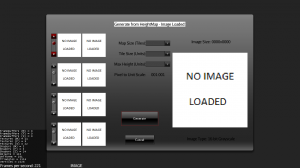 The image is loaded one strip of tiles at a time so very large maps can be processed with exceeding memory requirements. Next I’ll be working on the ‘j3o’ tile generation for my terraintiler library using textures that can be loaded on the generation screen. More on that later. Any comments of the code so far would be very appreciated. As the screenshot shows, the original file is 8192×8192 pixels, in 16-bit gray-scale. Some visible progress on the terrain editor program, after bitching with Nifty-Gui I think I’m getting the hang of it. just piecing the menus together and adding code functions to them, once they’re all done the real work can begin. Still working on this as time allows so updates will continue sporadically. Right now the terraintiler-library plugin is finally available from the jME SDK Plugin list so I’ve removed it from the the google code repo. Anyone using this code can now add the plugin and then add the library to their project and it will work. The google code repo at https://code.google.com/p/my-terraintiler-test/ now just has the demo-test code for the library. 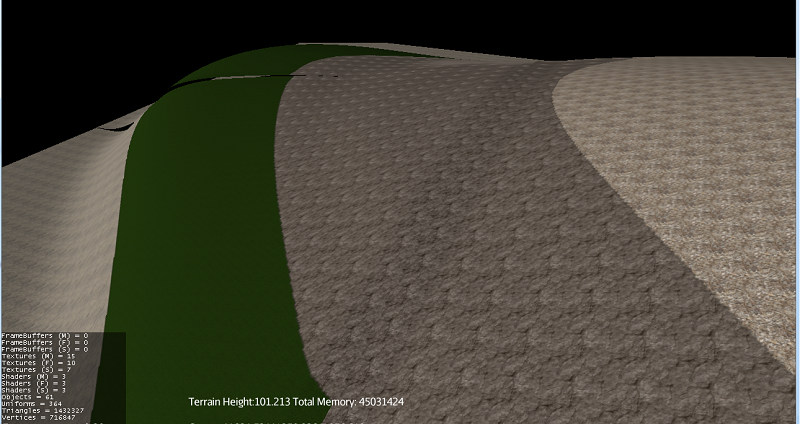 I’ll be slowly building the TiledTerrain editor up within this code until it is mature enough to be standalone. I’m still undecided as to how the editor will work: either as a jME SDK Integrated plugin or as a standalone application… integrated would be nice but I’ll have to see if it is even possible…. Another Video. Same camera path as previous posted video but this time a small addition to the code was added to test the Action Hooks for Tile Attached and Tile Detached. Pretty quick and dirty but does the test, “tree” is a Spatial that is a pre-loaded model. The tree model is a very ugly tree imported from a Blender file I found from a quick “free model” search. “treeList” is a ConcurrentHashMap for storing the trees created so it can remove them later. The code throws a random number of trees into the list, provided its location is within a set altitude range. When the tile is detached it finds the trees with the tile ID and removes them. 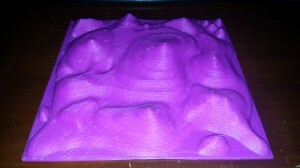 Next is to test the terrain editing/modifying functions. My TerrainTiler class is now finalized as far as functions go, I’m now ready to make it a plugin for jME’s SDK for consideration in to the community collection. Made a quick video to show that this is progressing, almost at clean and optimize stage! Had a major headache in the tiler routine that was causing a big memory leak, still needs to be properly sorted but it’s not leaking at the moment. Still not sure if it was my code or the engine library I’m using. Sort it eventually. Terrain generation has started coming together, still needs more work but here’s an early screenshot for progress. Needs seam welding between the tiles and better smoothing routines but its a start. Gives me something to work on.